Studio Host and Skype participant to be recorded inside your DAW utilizing a slightly advanced configuration. The session will require a proper mix-minus using your mixer’s Aux Send to feed the Skype Input – minus the Skype participant. [– Two discrete mono Host/participant recordings with minimal or no processing. [– Host Mic routed through a voice processing chain using plugins. [– Incoming Skype routed through a compressor to tame levels, if necessary. [– One fully processed stereo mix of the session with the Host audio on the left channel and the Skype participant on the right channel. 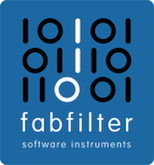 [– Real time recording and output. There are certainly various ways to accomplish these objectives utilizing a Bounce to Track concept. The optional inserted plugins and even the routing decisions noted below are entirely subjective. And success with this implementation will depend on how resourceful your system is. I would recommend that you send the session audio out in real time to an external recorder for backup. First I’ll mention that I’m using a Mackie Onyx 1220i Firewire Mixer. This device is defined as my default system I/O. The mixer has a sort nifty feature that allows the creation of a mix-minus just by the press of a button. Pressing the Input button located on the mixer’s Line In 11-12 channel(s) sets the computer’s audio output as the channel’s input, passing the signal through Firewire 1-2. Disengaging this button will set the Input(s) to Line and the channels’s 1/4″ Input jacks would become active. Skype recognizes the mixer as the default I/O. So I plug my mic into the mixer’s Channel 1 Input and hard-pan left. I then hard-pan Channel(s) 11-12 right. With the Input button pressed – I can hear Skype. In order to create a successful mix-minus you need to tell the mixer to prevent the Skype input from being inserted back into the Main Mix. 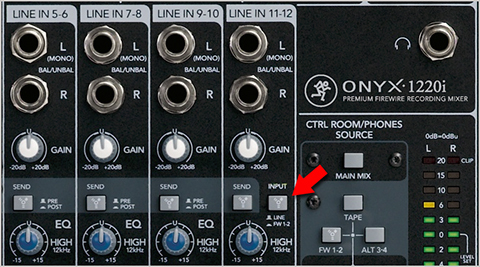 These options are located in the mixer’s Source Matrix Control area. This configuration translates into a Pro Tools session by setting the Track 1 Input (mono) to Onyx Channel 1 and the Track 2 Input (mono) to Onyx Channel 12. I now have discrete channels of audio coming into Pro Tools on independent tracks. Typically I insert noise reduction plugins on the Mic Input Channel. 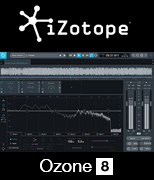 A Gate basically mutes the channel when there is no signal, and iZotope’s Dialog DeNoiser handles problematic broadband noise in real time. At this stage the Skype Input is recorded with no processing. Next, both Input Channels are bused out to independent mono Auxiliary Inputs that are hard-panned left + right respectively in preparation to route the passing audio to a Stereo Record bus. To process the mic signal passing through Aux 1 I usually insert something like Waves MaxxVolume, FabFilter’s Pro-DS, and Avid’s Impact Compressor. For the Skype audio passing through Aux 2, I might insert a gain stage plugin and another instance of Avid’s Impact Compressor. This would keep the Skype audio in check in the event the guest’s delivery is problematic. The last step is to bus out the processed audio to a Stereo Audio Track with it’s channels hard-panned left + right. This will maintain the channel separation that we established by hard-panning the Aux Inputs. On this track I may insert a Loudness Maximizer and a Peak Limiter. 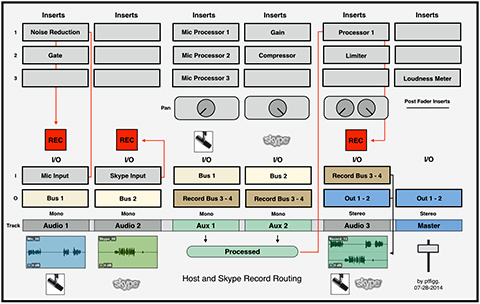 The processed and recorded stereo file will contain the Mic audio on the Left Channel and the Skype audio on the Right Channel. Finally you’ll notice I have a Loudness Meter inserted on the Master in one of the Pro Tools Post Fader inserts. Once a session is completed I can disarm the “Record” track and monitor the stereo mixdown. Since the Loudness Meter will be operating Post Fader, I can apply a global gain offset using the Master Fader. Output measurements will be accurate. Of course at this point the channels that contain the original discrete mono recordings would need to be muted. All the recording and processing steps in this session can be executed in real time. You simply define your Inputs, add Inserts, set up panning/routing, and finally arm your tracks to record. You will be able to converse with the Skype guest as you monitor the session through the mixer’s headphone output with no latency issues. When the session ends you will have access to independent mono recordings for both participants and a processed stereo mix with discrete channels. 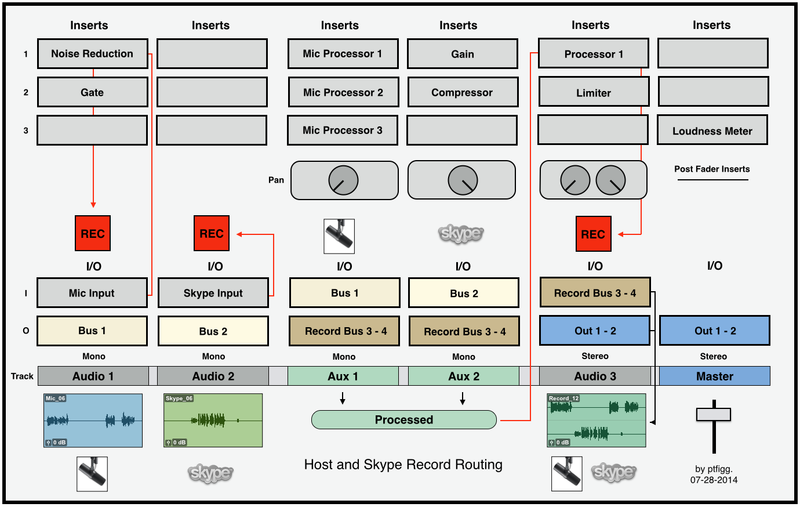 Note that you can also implement this workflow as a two step process by first recording the Host/Skype session as discrete mono files. Then Bounce to Track (or Disk) to create the stereo mixdown. Again the efficiency of this workflow will depend on how resourceful your system is. You might consider running Skype on a separate computer. And I reiterate: as you record in the box, consider sending the session audio out to an external recorder for backup.